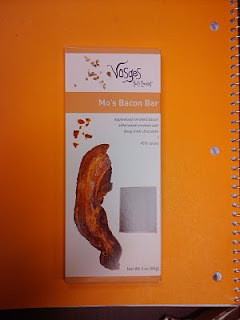 Rich recently gifted me a Vosges Mo's Bacon Bar about a month ago. I finally remembered to bring it back so we could break it open and give it a try. Katrina has been experimenting with bacon since the age of 6. I think she's perfected the bacon & chocolate combination. It's a dark chocolate (45% cacao) which allows the smoky-salty bacony goodness to come through but does not overpower it with bitterness or sweetness. We're impressed.